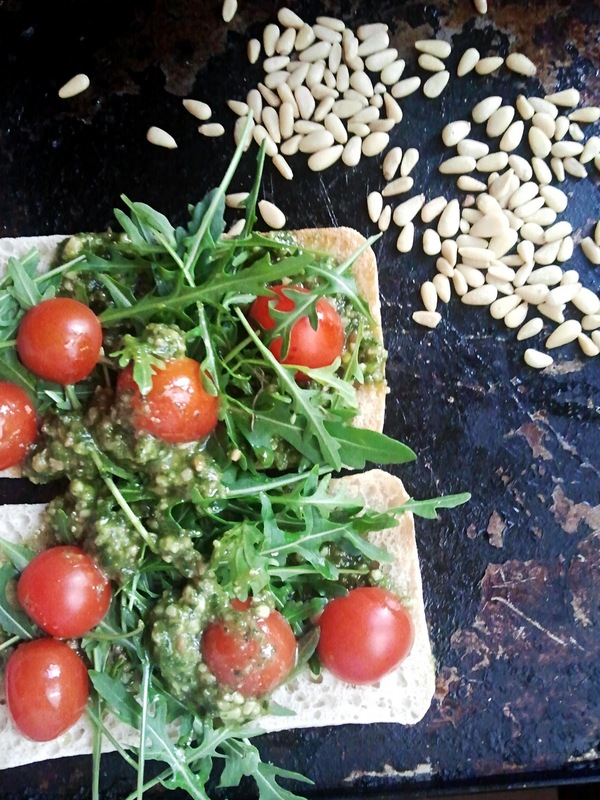 Lightly toast your bread and your pine nuts. Toss the nuts a few times, watching carefully that they don’t burn. Take the bread out of the oven. Spread a little olive oil on your bread then smear some pesto over it. Chop the tomatoes and place on the bread along with the rocket. Cut rough pieces of goats cheese and place on top of your sandwich. Don’t be concerned over neatness, the rustic look of the sandwich is part of its appeal. Place back in the oven to toast again for a few minutes, just till the cheese melts. Plate up then sprinkle your toasted pine nuts over it. This entry was posted in Food and tagged homemade, Lunch, Quick, Recipes.